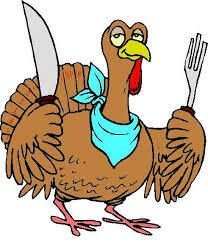 Time for a little history lesson and this being a holiday weekend lets talk turkey. The year was 1620. The American Revolution was still many years away, but a little known piece of American history was about to unfold. America was young then and the Thanksgiving holiday had yet to be recognized. However, such was not the case for the Native American Turkey. Thanks to a group of early American paparazzi, they WERE recognized. The reason for their recognition may have had a little something to do with bullseyes being pinned to their backs by some early American hoodlums called… The Pilgrims. Nevertheless, we must remember that Pin the Tale on the Donkey was nearly a century away from being legalized in America… and donkeys were in short supply. So, naturally, what other prank could a young misguided Pilgrim play on someone—or on some turkey? It also should be noted that the The Pilgrim Gang (as they later came to be called) carried boom boom sticks. Native Americans called them Blunderbusses, but they had a better command of the new American-English language—having been here longer. Now these young Pilgrim hoodlums became so good with there boom boom sticks that they were actually able to hit the broad side of a barn—from only two-feet away. And without pulling the triggers! Seeing as they were now wearing bullseyes this became something of a grave concern for the turkeys. 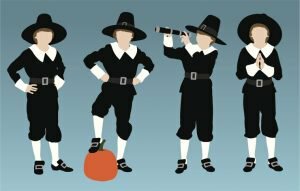 So one day, as the turkeys were gathering on Lexington Green, black coated Pilgrims took aim and fired their boom boom sticks into the crowd of turkeys. Apparently, the men in black figured out what the triggers were for—and then quickly adopted The Second Amendment. When all was said and done, half a dozen turkeys had fallen—and couldn’t get up. A warning went out far and wide “The black coats are coming, the black coats are coming!” because turkeys are known for repeating themselves. You know like … gobble, gobble. That’s when the turkeys turned to a young turkey—one Tom by name—to lead them in a revolt. Well, the next thing you know those trigger happy black coats fired on Tom the Turkey, and there he gave that one life, because turkeys (unlike cats) only have but one life to give. Unfortunately, in the process of gobble gobbling… he also gave away the position of all the other turkeys! 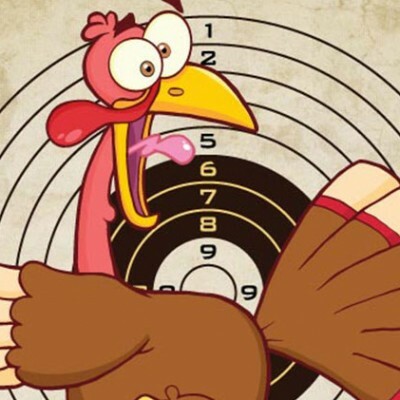 Today, we still remember The Great Turkey shoot of 1620 and the turkeys who gave their lives—albeit… involuntary. This is why we share our tables with their offspring when we gather to eat on the last Thursday of every November. Oh… and we celebrate by watching football too. But … ALWAYS IN THEIR MEMORY! And it beats the hell out of eating meatloaf on Thanksgiving. So, eat up, and Happy Thanksgiving everyone! I must have missed this vital piece of American history whilst in school. Therefore, I must thank-you for sharing your knowledge about the erstwhile Pilgrim hoodlums and the doomed turkeys. Alas, it saddens me that poor Tom could not be the recipient of a presidential pardon. Thank-you! Wouldn’t this story be a blockbuster on the big screen? “Murder Most Fowl” has a very enticing ring to it! I thank that one turkey for his noble sacrifice and lack of intelligence in giving away the location of his brethren, as does my full belly. Perhaps it isn’t just a coincidence that “Macy’s” and “Mayflower” start with the same sounds. If only it hadn’t been so obscure and ambiguous at first. Of course, now it all makes sense to me… Macy’s, Mayflower. I should have picked up on it right away, but it was all so subtle. Oh, they’re clever those Macy’s people. Like when they advertise those Macy’s white flower days. Then when you get down there, there isn’t a single white flower to be found in the entire store! It’s like it was all a ploy to get you inside their doors, only to tell you that they had a run on white flowers that day, and that they’re all sold out! If I didn’t know better, I’d say they were just trying to get you to come down and buy something other than a white flower. This just adds to the connections – do you think it’s a coincidence that those flowers aren’t there? There “may” be a “flower” – the connections between the two are myriad, we just have to notice them. There’s obviously more here than meets the eye. I think if we’re to ever get to the bottom of this flower mystery we’ll probably have to dig deeper to get to the root of the whole thing. This is a Thanksgiving cover-up this is! I always knew that phrase “I have put one life…” was uttered by a turkey! Hope your t-day was a great one. Should have been “but one life” – some turkeyess obviously overdid it yesterday. I had to share this outstanding piece of American history with my daughter. She, too, was unaware of this tragic event…however, she did think it sounded familiar ( especially, the “one life to give” part ). I reminded her of Mark Twain’s words : “History does not repeat itself, but it does rhyme.” She also thought you should be made aware that “Agatha Christie” has a familiar ring to it too! The Pilgrim Gang – like the Apple Dumpling Gang? Something was afoul, (HA!) when someone or something has a stutter, of course, they are going to repeat themselves. (as my 14 year old would say ‘ um duh? ‘ ) Were awards given to the Pilgrim that shot so many turkeys – now we understand where that carnival game came from – they got a stuffed prize? (hence stuffing?) I’m starting to understand SO much about history…like the commercial…I’ve fallen, and I can’t get up… like the turkeys. Sandi, as you well know this issue of whether the Pilgrim Gang and the Apple Dumpling Gang were actually one and the same has been a hotly debated topic ever since actor Tim Conway come out and said it’s true. For example, there was that famous gunfight between the Dalton Gang and the James Gang at the KOA Corral—I mean campground. Then there was that West Side Story involving some Gangs of New York—you know, the (New York) Jets and the Sharks—where they had a rumble or two (and even sang some show tunes) over the controversial issue. Of course, nothing ever came of it… except some mega-star movies, but that was about it really. Also, to answer your question, yes I believe the Congressional Wishbone of Honor was indeed awarded to one, Scott Pilgrim, for his bagging of sixteen turkeys in a minute—not easy when you consider he had to keep reloading! Also, I am currently looking into a report that claims I stole that famous catchphrase “I’ve fallen and can’t get up” and erroneously wrote it into my (well researched and historically accurate account) of how one turkey uttered that famous line upon being shot by that Pilgrim firing squad. Well, I just wanna say that I know for a fact that some unscrupulous type tried to make a fast buck off that poor dead turkey’s ignominious death (that we might eat well) by making a television commercial out of it, showing some old geezer lying on a floor mumbling “I’ve fallen and can’t get up! Is nothing sacred anymore when it comes to these Madison Avenue types? My god, making a profit off the misery of some heroic turkeys? How do they sleep at night? Other than the tryptophan I mean. show tunes killed us – or video killed the radio star? They are all linked some how. WE’re onto them…whoever THEM may be…letting them know we can’t be fooled. WE’ll blog about it…in detail…while stuffing our faces, and shooting our mouths off…or guns…something. It’s all been a crap (er) Turkey shoot! Hence the Turkey Trot…better get moving. Yeah, we’ll show them. THEM, always think they can fool people like us—but thank god never us ourselves. But fooling those people who are like us (but who are more than likely our clones) won’t be easy because even though they’re not us they’re like us—and we’re Nobody’s fool. However, if only we didn’t belong to Nobody, then we wouldn’t be Anybody’s fool and I’m almost certain that he would then be trying to pawn us off on, Somebody! And I shudder to think what that guy might do with us! Probably send us out on some fool’s errand. to shoot some “double talkin'” turkeys. What would we do without you Paul to set the historical record straight? Thank you much for this illuminating piece. You’re so funny. Have you heard from Bruce (Sportsattitudes) lately? Okay, I kind of thought as much as well because I checked his blog and noticed he hasn’t updated it since earlier in the year. I think I still have his email address. If I do I’ll reach out and if I hear anything I’ll let you know. This year I’m making this blog a priority to communicate with people because I hate losing contact. I know life happens and we all get called away to live our lives but I’ve lost a couple of people and I’d like to keep in touch as much as humanly possible. Don’t even get me started on colds and flu. I had one right after the other beginning in October through December. The past two weeks is the best I’ve felt in months. I’ll circle back with you if I hear anything.